So, I’m heading down to sunny Miami on Wednesday to support my nascent film career and sell some prints. 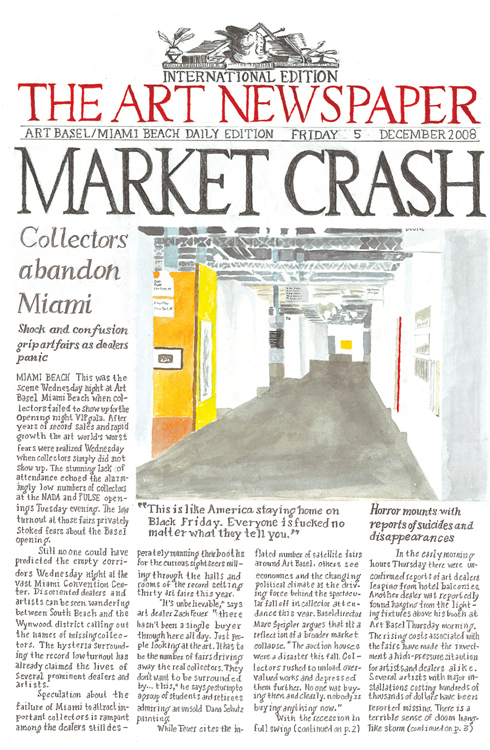 If you haven’t seen it yet, Market Crash is available as a limited-edition print that Doug at the LES Print Shop executed it for me. Signing the fifty prints made me feel a bit nauseous, but that’s what happens when you sell out. No, it’s a beautiful print of a work on paper that Ed Winkleman stole out of my studio. Upon seeing the drawing, he announced “This is your first auction piece.” Well, if it is Ed is going to have to make his own prediction come true and sell it to Larry Gagosian for $24 million. I hope Ed is right and I am wrong. I’d hate to see the art world come crashing down. Anyway, I’ll be in Miami from Wednesday to Monday getting loaded at various VIP events and parties with a cast of characters. If you are in town, please check out my recent absurdities with Schroeder Romero at PULSE and Platform at the AQUA Hotel fair. My video, A Study For Sofia Coppola’s Film ‘Powhida’ will be screening at both fairs. At AQUA the film we be showing at set times, 2, 4, and 6 on a 50″ LCD monitor with Platform Gallery. Stephen and Blake will have to deal with the fallout as I will be passed out on the beach. I encourage you to drink heavily before, during, and after the study for Sofia’s film. So far she has not responded to my entreaties, but I know she will come around. Jan Leyssens as William Powhida mid-meltdown.